‘Tis the season to be thankful. But beware. There are some risks that you should weigh before jumping on the gratitude bandwagon. 1. Don’t be thankful if you think you deserve all those good things that come your way. When I express thanks I notice that my sense of entitlement starts to wash away. A special thanks to my husband for keeping the cars running smoothly makes me realize that he doesn’t really have to do that. A generous tip and thanks to the waiter is a recognition that I received more attention than I deserved. Giving thanks to God for the colorful sunset takes away from my argument that he owes me a little more. So beware. Don’t allow gratitude to creep into your life if you are convinced that you deserve all good things. 2. Don’t be thankful if you take pride in your self-sufficiency. Gratitude makes you realize how much you depend on others. It’s easier to think that you can conquer the world on your own if you don’t stop to give thanks to people who help you along the way. Don’t start thanking those around you if you don’t want to admit your dependency on them. 3. Don’t be thankful if you like your areas of discontentment. I have some corners in my heart where discontent attitudes are nicely tucked away. If gratitude sneaks into those areas it will soften the edges that justify my criticalness. I recently caught myself stuffing a thankful thought so that I could hold on to my discontentment a little longer. Beware—gratitude will change your perspective. You are likely to find good in the people or circumstances that you don’t want to see good in. I’m sure that there are more consequences to consider before you take the risk of gratitude. Feel free to add more warnings below from your own experiences. Personally, I’m a risk-taker. 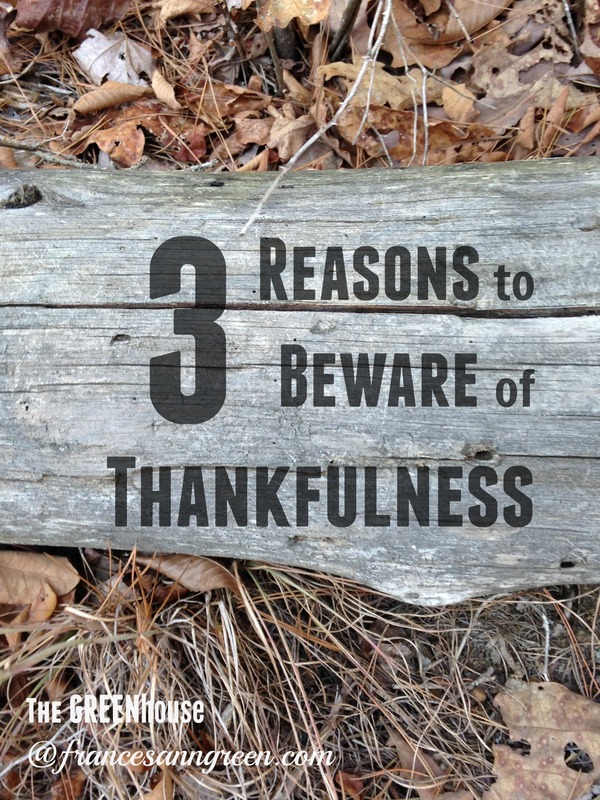 So, after weighing the warnings I think I’ll embrace the season of thankfulness—whatever the costs may be. Be thankful at your own risk. Great post. You are right on! As my friend Charlie Jones said, “The first sign of greatness is thankfulness and the first sign of smallness is thanklessness.” This is truth my friends! That’s an insightful quote about thankfulness. Thanks for sharing that! You’re welcome… It’s one of my favorites.